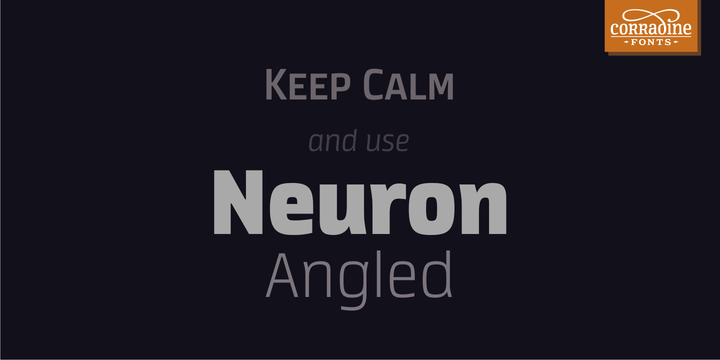 Neuron Angled is a font created by Manuel Eduardo Corradine, Sergio Ramírez and published by Corradine Fonts. Preserving the main characteristics of the preceding Neuron font, Neuron Angled brings novelty regarding the accuracy of lines and flat endings. Offering a wide range of typographic features, it succeeds in ingeniously combining the traditional and modern aspect which makes it suitable to a great variety of projects. The different options, available within the type family, enable the user to work with Western, Eastern and Cyrillic styles. ‘Neuron Angled’ is a trademark of Corradine Fonts. A font description published on Tuesday, September 24th, 2013 in Corradine Fonts, Fonts by Iulia that has 3,486 views.